​– See here for a description of the Respective Roles of the Parish and the Parent(s). Our programme is a purely Family-Based programme and is for children who turn 7 years or older in the current year. It is all done in the context of your family. It assumes that you live in and/or worship here at Stafford. The school your child attends is not relevant at all (We have both State and Catholic schools in our parish). The composition of your family, its ethnicity, or its history is irrelevant. All that is needed is a desire and a commitment from the parent(s) to grow in their own faith and to help their child do the same. Normally around late May/early June we advertise for parent(s) to come to an Introduction Meeting (which is not optional) to find out more about the programme and then to enrol in the actual journey of faith with their child(ren). This advertisement will be published in the Parish newsletter, the newsletters of all the local State Schools (notice is sent to these schools – we cannot be responsible for their publication), and our local Catholic School “Queen of Apostles”. 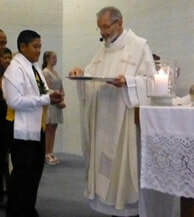 You may find an excellent video and FAQ’s on the Sacraments of Confirmation and Eucharist (Communion) by selecting the following links which are on the Archdiocesan Website: http://flameoffaith.org.au/confirmation and http://flameoffaith.org.au/eucharist . 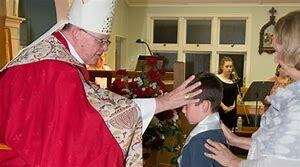 The Sacrament of Penance (Confession) – First Rite is prepared for and celebrated in the year the child turns at least 10 years old. Normally advertising for this programme happens late January/early February. Refer to http://flameoffaith.org.au/penance. We will be available to you whenever possible to support you in your own faith development through personal discussion, input via regular parent meetings, adult education for the wider parish, or whatever means required. We will make available to you resources to help you create a routine of family prayer. We will provide support for you to enable you to be more involved in our Weekly gathering at Mass with your child(ren). We will give you resources to help yourself and your child understand the meaning of the Sacraments. If you have “issues” with the church with regard to its position on various subjects (real or misunderstood), we will help you understand the reality of the situation and support you in the celebration of the Sacraments. We/I will strive to establish/continue regular family prayer that is integrated into our current life. We/I will encourage my child(ren) in their knowledge and understanding of the Sacraments using the family resources provided. We/I will make it a priority to attend the Parent meetings for our/my own support and information. We/I will continue to encourage our/my child(ren) to do things for others thus developing an ethic of “making the world a better place”.